to more effectively kill infection and help heal your gums. An important part of regular checkups is the periodontal examination. The word periodontal literally means “around the tooth.” If the exam reveals that you have moderate periodontitis, there are several non-surgical techniques that can stave off surgery. These include laser curettage (cutting away the infected gum tissue), antibiotics both topical and oral, and root planing (also called scaling). Root planing is similar to normal dental cleanings, but the procedure is more aggressive and requires removal of plaque and tartar from below the gum line. Root surfaces are cleaned and smoothed with specially designed instruments. Once the accumulated plaque and calculus have been removed, a prescription anti-microbial is applied and the gums can heal, tightening around the teeth. 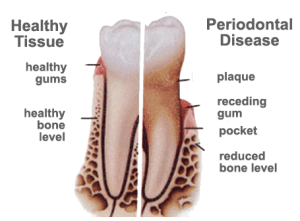 If the disease is advanced, Dr. Foutz may refer you to a specialist for periodontal surgery. Maintenance therapy is an ongoing program designed to prevent periodontal disease from recurring in people who have undergone periodontal treatment or surgery. Regular periodontal monitoring is especially important for women because of hormonal fluctuations which can affect gum tissue and menopause which can increase the likelihood of osteoporosis. Studies suggest there is a link between osteoporosis and bone loss in the jaw. Women considering Hormone Replacement Therapy (HRT) to help fight osteoporosis should note that this may help protect their teeth as well as other parts of the body. Women who are menopausal or post-menopausal should ask for a periodontal exam from Dr. Barton H. Foutz, DDS.